Mesmerising Madhuri – Will planetary transits change her destiny? Mesmerising Madhuri - Will planetary transits change her destiny? If there's anyone in Bollywood who can even claim to come close to yesteryear beauties Madhubala and Nargis in grace and talent, then it has to be Madhuri Dixit. The 'dhak dhak girl' who reigned supreme on the silver screen in the late 80s and 90s has been a heartthrob of the millions across the globe. She has won many awards and accolades for her spectacular performances in the films like Tezaab, Beta, Hum Aapke Hai Koun, Dil To Pagal Hai and Devdas. After ruling the industry for around 15 years, Madhuri, quite unexpectedly, married Dr Shriram Nene, a US-based surgeon. She happily quit the life of a superstar to be a wife and a mom. In 2008, she was awarded Padmashree, and recently she featured in the list of '33 women who made India proud' by The Economic Times. By leaving Bollywood, Madhuri has left a void in the industry, which is yet to be filled. Artist MF Hussain's muse and choreographer Saroj Khan's darling, will Madhuri Dixit-Nene once again cast her magic spell on the silver screen? Ganesha predicts her destiny with the help of Vedic Astrology System. Currently Rahu is transiting through the 2nd House and Ketu through the 8th House. In the coming year, Jupiter will transit over the Natal Saturn. Saturn will be transiting over Natal Mars, and it will maintain opposition with the Natal Saturn. 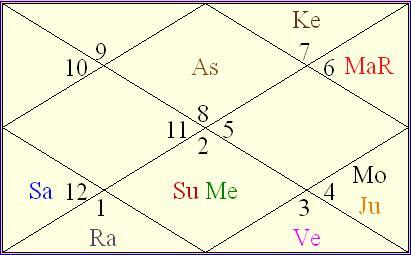 Venus is in the 8th House in Rahu's Constellation over which Ketu is transiting. She is under the influence of Venus major-period and Rahu sub-period till August 2010, after which sub-period of Jupiter will be ruling. Jupiter is exalted and placed with Moon in the 9th House of luck. Hence creates 'Gaj Kesri Yog'. Ganesha notes that Venus, the significator of Arts is in an inimical planet Rahu's constellation Ardra, which indicates sudden break in career as an actress. In the days to come, Madhuri will be under the favourable influence of Jupiter's transit but transiting Saturn will not allow Jupiter to give full benefits because Jupiter will be in opposition with retrograde Mars placed in the 11th House, and it will have to confront Saturn while it transits through the 5th House. Because of Venus Dasha and Rahu Antardasha, she will not be lucky enough to have an opportunity to enthral the audience once again. Moreover, Karma Bhuvan Lord Sun is placed in the 7th House, due to which it loses its strength. This factor will not allow her to rejoin the film industry. However, the good news is that Ganesha foresees her playing some important roles post-August 2010 once Venus major-period and sub-period of Jupiter begins. She will enjoy the limelight due to this favourable planetary Dasha Bhukti. But as 'Natal promise' for a flourishing career in the film industry is weak, she is not likely to have a full-fledged career in films in near future, despite favourable transits and Dasha Bhuktis. Ganesha wishes Madhuri Dixit-Nene, a very happy birthday!